Water Damage: What Can be Saved After a Flood? 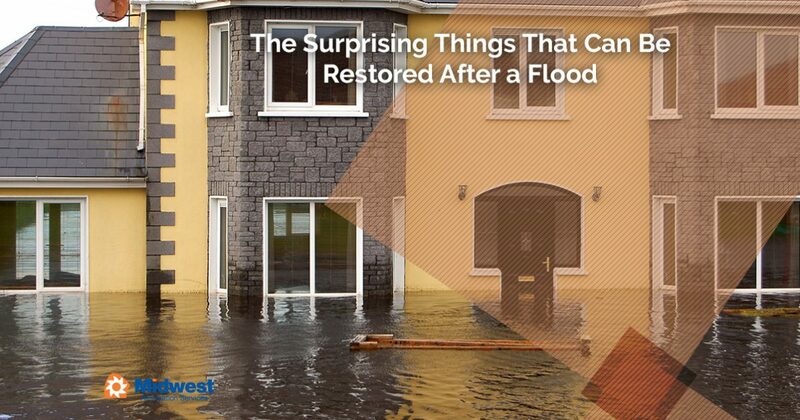 When your home has been damaged by a flood, it might at first feel like everything is ruined. Many people don’t really understand the total devastation of water damage until they’ve experienced it first hand, but it’s pretty incredible. Walking into your home after it’s been flooded is a sobering experience. Nothing looks the way it did before and you might think that it’s all lost. But before you start throwing everything out, it’s important that you speak to a professional restoration service. There are a number of things that can be restored to nearly their original state that might surprise you. Take a look around your home. How many electronic items do you have in your living room alone? Most people have a television, some sort of cable box, and maybe a DVD player. You may also have a laptop (or two) and a tablet (or three) around the room. And that’s just the living room. Your kitchen, office, garage, and probably even your bedroom are filled with electronics. So what’s going to happen to them if your home floods? You might think you’ll need to throw out all of these devices and replace everything. However, a qualified restoration professional should be able to save a majority of these products. The key is to act quickly before the devices start to rust. We were once promised a paperless society, but it turns out we have just as much paperwork as ever (and maybe even more!). A lot of this paperwork provides us with an important trail of information about our finances, health history, vital records, and much more. So losing all of that important paperwork can be devastating, affecting your life for years to come. But if you act quickly, a document restoration specialist can often save your most important paperwork. Things like birth certificates, social security cards, and passports should all be priorities. For many people, the thought of losing their family photos is the most devasting part of a natural disaster. When you ask someone what they’d save in a fire, they often mention their family photos. Thankfully, today most of our photos are saved on the cloud, easily retrieved when needed. But for photos from 20 or more years ago, there might not be a way to reprint them. Happily, most photos can be saved! Using a gentle washing technique, restoration specialists can remove the debris from a flood and restore the photo very close to its original state. A lot of clothing can be saved after a flood! Even if it looks hopelessly muddy and soiled, most clothing can be washed and repaired. In most cases it’s going to take more than a spin through the washer and dryer, though. You’ll want to talk to your restoration specialist about where and how you can get your clothing properly cleaned. Remember, flood waters have a lot more in it than just clean water; you’ll want to get all of that out of your clothing to eliminate smells and potential health hazards. What pieces of furniture can be restored after a flood is going to depend on a number of factors. First, the quality. Furniture that’s made from particle board won’t survive a flood because the materials are going to absorb too much water. Furniture made from metal or real solid wood are much more likely to survive. Additionally, furniture with a lot of padding (like sofa and easy chairs) might not make it due to the fact that they are hard to dry out quickly enough to prevent mold. But side chairs, dining chairs, and other pieces can be saved (although they might need to be recovered). What Should You Get Rid Of After a Flood? It’s important to note that this is a general list; your specific items may be able to be salvaged depending on the severity of the flood and how the items were originally made. A professional water restoration team will be able to advise you on what can and can’t be saved. If you have questions, feel free to ask them, but remember that when it comes to your family’s safety, it’s better to be safe than sorry. Need the help of a water damage restoration pro? Get in touch with our team today by giving us a call or contacting us through our website.